محبّی گرگری, رحیم, بیات کشکولی, علی, معظمی, وحید. (1397). بررسی شاخص‌های مؤثر بر توسعه پایدار زراعت چوب صنوبر در ایران به روش مقایسات زوجی. مجله صنایع چوب و کاغذ ایران, 9(2), 235-249. رحیم محبّی گرگری; علی بیات کشکولی; وحید معظمی. "بررسی شاخص‌های مؤثر بر توسعه پایدار زراعت چوب صنوبر در ایران به روش مقایسات زوجی". مجله صنایع چوب و کاغذ ایران, 9, 2, 1397, 235-249. محبّی گرگری, رحیم, بیات کشکولی, علی, معظمی, وحید. (1397). 'بررسی شاخص‌های مؤثر بر توسعه پایدار زراعت چوب صنوبر در ایران به روش مقایسات زوجی', مجله صنایع چوب و کاغذ ایران, 9(2), pp. 235-249. محبّی گرگری, رحیم, بیات کشکولی, علی, معظمی, وحید. بررسی شاخص‌های مؤثر بر توسعه پایدار زراعت چوب صنوبر در ایران به روش مقایسات زوجی. مجله صنایع چوب و کاغذ ایران, 1397; 9(2): 235-249. زراعت چوب و توسعه پایدار آن با توجه به فقر جنگلی و مخاطرات فراوان زیست محیطی و اقلیمی پیشِ‌رو از جمله راهبردهای اساسی محسوب می‌شود. لذا شناسایی و اولویت‌بندی شاخص‌های مؤثر بر توسعه پایدار زراعت چوب صنوبر در ایران با استفاده از روش مقایسات زوجی، هدف این مطالعه بوده است. بدین‌منظور، پس از بررسی‌های میدانی و مصاحبه، 4 شاخص اصلی"مسائل اقتصادی و اجتماعی، حمایت و پشتیبانی از کشاورزان، روش کاشت و زیرساخت‌ها" و 25 زیرشاخص مهم شناسایی شدند. اولویت‌بندی این شاخص‌ها و زیرشاخص‌ها با نمودار سلسله مراتبی، پرسشنامه‌ها و ماتریس مقایسات زوجی انجام شد و ارزش وزنی هر یک از آن‌ها با استفاده نرم افزار Expert Choice محاسبه گردید. نتایج نشان داد که از میان 25 زیرشاخص تاثیرگذار در توسعه پایدار زراعت چوب صنوبر در ایران، به‌ترتیب زیرشاخص‌های معیشت سالیانه خانوارها (162/0)، آزادی واردات و صادرات چوب صنوبر (135/0)، ارائه مناسب ارقام جدید و پربازده مانند نهال‌های اصلاح شده (093/0)، استفاده از پتانسیل‌ مناطق مستعد صنوبرکاری (079/0)، تضمین خرید محصولات (067/0)، تشویق‌های مالی و وام به صنوبرکاران (058/0) و بازگشت سرمایه پس از 8 تا 10 سال (049/0) در اولویت قرار دارند. Amiri Lemar, A. and Moradman Jalili, A., 2015. Factors affecting the degradation of natural resources. Journal of Forest Sustainable Development, Rangeland and Watershed Management, 249-257. Amani, M. and Parvizi, A., 1995. Haloxylon, foresters and silviculture. Publication of Islamic Culture Publications Office, First Edition, 120p. Mokhtari, J. 2000. Poplar wood planting as a practical solution in wood production. Conference of Afforestation with fast growing species in the north of Iran (proceeding), 72p (In Persian). Mokhtari, J., 2000. Poplar wood planting as a practical solution in wood production. Conference of Afforestation with fast growing species in the north of Iran (proceeding), 72p (In Persian). Mosadegh, A., 1996. Silviculture, Publication of Tehran University, Tenth Edition, 481p. Yakhkeshi, A., 2003. Management of forests and grasslands and protecting the environment Compared with the management system of some European countries. 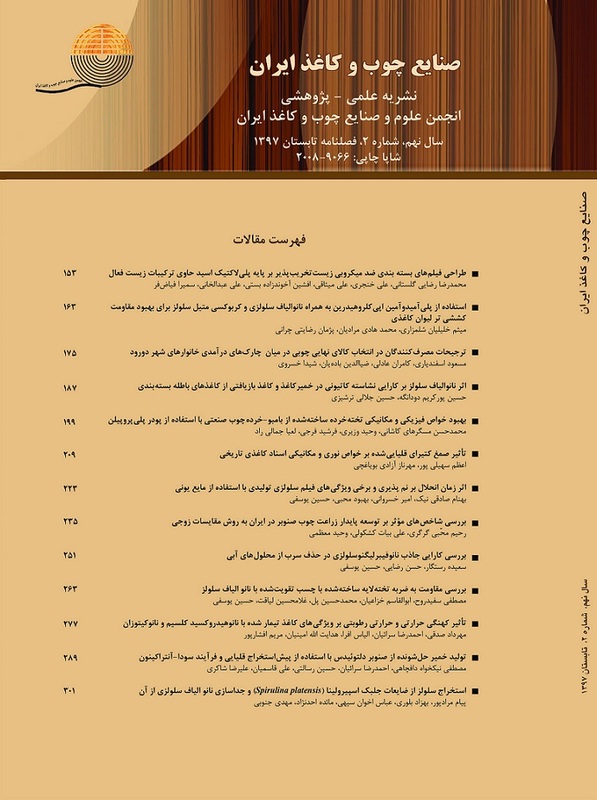 Publication of Mazandaran University, 302p. (In Persian). Engindeniz, S., 2003. Determination of economical financial rotation lengths of hybrid poplar plantations: the case of turkey.Pakistan Journal of Biological Sciences, 6(1): 41-47. Pirouzan, H. and Barimani, A., 2011. The importance of Wood farming, First National Congress of the roadmap supply of raw materials and the development of Wood and Paper Industry in 1404, Gorgan University of Agriculture science & Natural Resources, 22-23 : 13-19. (In Persian). Lashkarbolouki, E., Pourtahmasi, K., Oladi, R., Kalagari, R. and Alizadeh, H., 2016. Recognition and ratting off effecting indexes on the consumption of pulp and paper industry production from different poplar plantation sites in Iran. Iranian Journal of Wood and Paper Industries, 7(3); 425-436. (In Persian). Aminpour, T.,a 2008. Wood Farming, opportunities and challenges. Journal of Livestock and Agro-Industry, 11(107): 66-67. Abolfathi, M. and Hamedinejad, A., 2008. Fluctuations in the production of timber and development of wood industry in last half century. The 1st Iranian Conference on supplying raw material and development of wood & paper industry. 40 PP. (In Persian). Rowell, R., Yang, R. and Rol, G., 2002. Paper and material composite of agricultural resources. Boca Raton, Fla.: CRC/​Lewis Publishers, Wisconsin, USA, 573p. Hwang, J.W., Noh, E.R. and Hyun, S.K., 1993. Activities related to Poplar breeding, cultivation, exploitation and utilization in Korea, Institute of forest. The second national congress on spruce and its important in wood cultivation. May 1993, Korea, 481-482. Vatani, L. and Davanlou, M., 2008. Reviewing the obstacles and problems of public participation in performing ligniculture plan (a case study in the forestry domin of Mazandaran wood and paper industries). Proceeding of Second National Congress on Poplar and Potential Use in Poplar Plantation, 5-7 May 2008, Vol. 2, Research Institute of Forests and Rangelands Publication, Tehran, Iran: 355-358. (In Persian). Alizadeh Anaraki, K., Lashgarara, F. and Kiadaliri, H., 2012. Effect of Socio-economic factors on development of poplar plantation in Guilan province (Case Study: Somesara). Iranian Journal of Forest and Poplar Research, 20(2): 346-356. (In Persian). Hosseinzadeh, O., Hajjarian, M. and Porbar, S., 2016. Analysis off location quotient index of poplar wood processing value chain in Iran. Iranian Journal of Wood and Paper Industries, 7(1); 141-154. Azizi, M., Mohebbi, N., Mohebbi Gargari, R. and Ziaie, M.,2015. A strategic model for selecting the location of furniture factories: a case of the study of furniture. International Journal of Multicriteria Decision Making, 5(1/2): 87-108. Azizi, M. and Mohammadzadeh, K., 2016. A socio-economic problem regarding poplar plantation and a problem solving model by AHP. Socio-Economic Problems and the State, 14(1): 47-58. Farshchi, V. and Ghofrani, M., 2016. Assessment of market development factors affecting classic furniture (Case Study in Qom). Journal of Wood & Forest Science and Technology, 23(3); 89-106. Ghofrani, M., Zare, A. and Azizi, M., 2017. Identifying and prioritizing indicators and effective solutions to optimize the wood consumption in construction off classical furniture by using AHP ((case study: Qom province). Iranian Journal of Wood and Paper Industries, 7(4); 573-589. (In Persian). Roshanrou, N.S., Tajdini, A. and Pourmousa, Sh., 2016. Analytical hierarchy process in selecting the factors affecting the competitiveness of the corrugated box making industries in Iran. Journal of Wood & Forest Science and Technology, 23(2); 243-260. Mohebbi, N. Alizadeh, H., Azizi, M. and Faezipoor, M., 2017. Determination off effective criteria for location selection off WPC plants from agricultural residues in Iran by AHP ttechniique. Iranian Journal of Wood and Paper Industries, 7(4); 499-510. (In Persian). Masouleh Sharafi, A., 2009. Select and evaluate suppliers by using multi-criteria decision-making. Journal of Engineering and related industries, 1(6): 5-10. Jafarnejhad, A., 2006. Production management and modern operation. University of Tehran, 544-563p. (In Persian). Szulecka, J. and Zalazar, E.M., 2017. Forest plantations in Paraguay: Historical developments and a critical diagnosis in a SWOT-AHP framework. Land Use Policy, 60(2); 384–394. Mohammadian, F., Shahnoushi, N., Ghorbani, M. and Aghel, H., 2008. Choosing a potential crop pattern by using AHP analysis model (Case study: torbat-e-jam plain). Journal of Agricultural Science 19: 172- 187. (In Persian). Louis, E.B., James, P.E. and Fernanes. C.M., 1999. Agroforestry in Sustainable Agriculture Systems. CRC Press, lewis, 416 p.
 Bayatkashkoli, A., Ameri, S., faezipour, M. and Dousthoseyni, K., 2007. Economical assessment of poplar small-diameter timber and marketing of its wood products. Journal of the Iranian Natural Res., 59(4):963-980. Aminpour, T.,b 2008. Wood agriculture opportunities challenges. Proceedings of Second National Congress on Poplar and Potential Use in Poplar Plantation, Volume2: Harvest and Wood Industries, Pests and Diseases, Social- Economic issues, Extension and People Participation, Environmental Applications, Research Institute of Forests and Rangelands: 381-386. Lashkarbolouki, E., Kahneh, E., Mosavi Kopar, S.A. and Amanzade, B., 2017. Adaptability of new open crown poplar clones in Lasht-e Nasha area, Gilan province. Iranian Journal of Forest and Poplar Research, 24(4); 647-655. (In Persian). Khosh-Khui, M., Grigurian, V., Tafazoli, E. and Khalighi, A., 2008. Determination of present situation and guaidance for quantitative and qualitative improvements of important stone fruits (peach, apricot, cherry and plum) in Iran. Journal of Pajouhesh & Sazandegi, 81 (4): 181-190. (In Persian). Asareh, M. H., 2008. Introduction to the proceedings of the second national conference on agriculture and spruce wood, may 18-16, Publications, Research Institute of Forests and Rangelands, Tehran, Iran, 14-13 . (In Persian). Kia Daliri, Sh., Tabari, M., Sarmadian, F. and Ziabari Ziaee, S.F., 2004. Effect of soil type on some quantitative and qualitative characteristics of Populous X. euramericana (Dode) gunier. Journal of Pajouhesh & Sazandegi, 62(1): 45-50. (In Persian). Keshvari, Z., 2014. Do poplar are saved forests? Iran magazine, No: 03/13/2014-5661, News code: 16745, 8-9. Bozorgmehr, A., Nemati, A. and Zakeri, E., 2014. Characterizing the Socioeconomic factors influencing poplar plantation in North Khorasan Province. Iranian Journal of Forest and Poplar Research, 22(4): 711-723. (In Persian). Hosseini, R., 1997. Estimates of capital productivity in the agricultural sector in Iran (to separate subgroup of buildings and installations, machines and appliances business, public and private), Planning and Agricultural Economics Research Institute, 136p. Darvish, A.K., Chizari, M. and Mirdamadi, S.M., 2008. Analysis of socio–economic factors influencing on adoption of agroforestry among poplar farmers in northern part of Iran. Iranian Journal of Forest and Poplar Research, 16(3): 494-486 (In Persian). Lapar, M. L. and Ehui, S.K., 2004. Factors affecting adoption of dual-purpose forages in the Philippine uplards. Journal of Agroforestry Systems, 81: 95-114. Asadi, E., 2008. Extension of utilization of natural resources with emphasis on sustainable development and environmental protection, rural development and agricultural extension. Jihad Magazine, 225-224. (In Persian). Adeli, K., Saeedi, S.S., Namdari, S., Mohammadi Samani, K. and Yosefi, B., 2017. Financial maturity of populous deltoids Marsh. (Case study: Shalyshel village, Kurdistan province). Iranian Journal of Forest and Poplar Research, 24(4); 601-611. (In Persian).